A while ago I told you I was stuck with my research beccause I could not afford to build a library on the moon. Yes, it’s a long story, but it comes down to the fact that the proteins that transmit and store information in our body do this by undergoing changes to their function, shape, chemistry, location etc. Actually, this picture does not show all of CaMKII, only about one twelfth of it (well, one twelfth of what matters). But even for this little part of a protein, there are a lot of options: Is a phosphate group attached to it or not? Is it active or inactive? 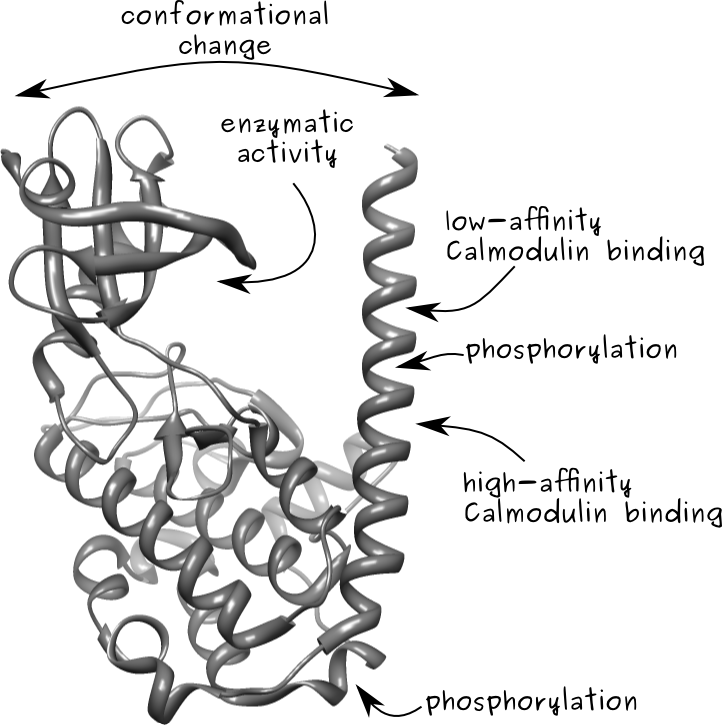 Bound to another protein called calmodulin or not? That’s already 8 possible states that little protein subunit can be in. With each new possible modification, the number of possible states doubles, and soon you have a mindboggingly big number of possibilities (what we call “combinatorial explosion”). This makes those proteins difficult to model using a computer. Unfortunately, modelling proteins using a computer is what I do for a living. Hence the dilemma. What did I decide to do? Go for a coffee, of course. But this turned out harder than I thought. I have long had a secret theory that everybody has one very specific and mostly useless superhero power. For instance, I have met a woman who, for years, has always woken up at precisely the same time every day (without using an alarm clock). I know a man who can sound exactly like a trumpet (without using a trumpet). And then there are several people dear to me who have an uncanny ability for finding four-leaf clovers. Communicating science: where is the evidence?